X Nimmt! * (that’s the first and last time I kowtow to it’s official exclamation mark) is a small box family card game for two to four players which takes 20-30 minutes to play (and should cost you less than a tenner). As with all Amigo card games it is very light on rules, but does have a little extra to think about than many of the games in this series – making the ages 8+ on the box feel about right. That said, you can easily introduce it to non-gamers. You’ll find just over 100 high quality, linen finish cards in the box, along with the rules – that’s it. I have to say I wasn’t overly taken with the colour schemes on a lot of the cards (purple and green? Yum…), but the numbers and symbols are easy to read so the colours weren’t a hindrance. They aren’t even necessary, as they have no impact on play – they simply help you spot cards of different scoring values. Anyone familiar with 6 Nimmt will be on very familiar ground here – especially for the first half of the rules explanation. All the cards are shuffled and each player is dealt eight. Three cards are also placed face-up in the centre of the table to show the start of the three scoring rows – with the rest of the cards put to one side for the rest of the round. You’ll play two rounds, with the player having the lowest total score winning the game. On each turn, each player chooses a card from their hand and places it face-down on the table. Once everyone has chosen these are revealed simultaneously and then placed onto the scoring rows in number order – not player order – with the lowest card placed first. All cards must be placed sequentially onto their most suitable rows (ie, the one with the closest number to it): so if the 25 and 23 cards are currently at the front of two of the rows, if you play your 30 it would have to go on the 25 – while if you played the 24 it would have to go on the 23. It’s easier to do than explain, and people pick it up in no time. You only get to choose where to lay if you play a card lower than any of those at the heads of rows: you win a row of your choice, and replace it with the card you just laid. But it’s not only laying low cards that wins you cards- and this is where X Nimmt starts to differ from 6 Nimmt. Each row has a card heading it which are numbered 3, 4, or 5. If you place the card that would be the third, fourth or fifth in the appropriate row, you win the cars there are the card you play starts the new row. As you’ve no doubt realised, ‘winning’ cards is a bad thing. As well as its number (between 1-100) each card also has a number of bulls heads depicted on it (between one and seven). Those will be your score at the end, with a score of 0 being a perfect round. In 6 Nimmt, cards you won simply go into a score pile to be totalled: but X Nimmt adds a layer of strategy to the mix. Each player also gets an ‘X’ card (see what they did there?) which they lay in front of them; this counts as the start of their own personal row, which works in the same way as the others (cards in it must go in ascending order). When you win cards, you choose one of them to add to your X row – the others go into your hand. If you have to add a card to your X row but can’t do so sequentially, the cards already there become your score pile and a card you just won starts a new X row. A round ends when one player plays the last card from their hand. Any cards left in your hand are worth the bulls heads on them, while those in your scoring pile count double (ouch). But cards still in your X row don’t score at all – so it is possible to win several rows of cards, but still end up with a 0 score thanks to good management of your X row. The writer: While I love the daft fun of 6 Nimmt, X Nimmt just feels like a better game to me. I’m still more than happy to play the original, which is at its best with five or six, but at the same time i’m a little confused while this version was limited to four players. Perhaps because 6 plays so well 5-6 and they didn’t want to cannibalise their own audience? Maybe it will say 5-10 on the box in future? Either way, I’ll be tempted to play X Nimmt with five and six, adding a six-card row to replace the three-card one, so see how it works. The thinker: I was a little on the fence about 6 Nimmt, as while it is well designed it felt a little too ‘random party game’ for me. But X Nimmt gives far more opportunities to be strategic – both thanks to having to place cards into your hand and into your X row. You need to be considering the game state (how many rounds do you think are left?) to make the right decisions, and the times where there is a definite one card worth playing have drastically reduced. The trasher: I love 6 Nimmt because its hilarious watching players pick up massive scores on cards – and because there’s not a mountain of skill involved, it’s even funny when it happens to me. But with X Nimmt you can sometimes actually choose who to stitch up – especially when you’re laying a low card, so getting to choose which row to take. This can make it a little bit personal if you want it to, which as far as i’m concerned can only be a good thing! 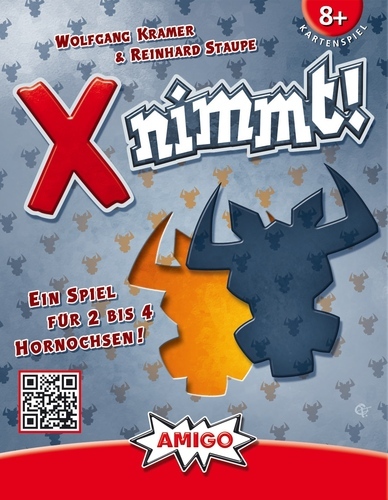 The dabbler: I love 6 Nimmt, but it was very poor with two or three players (it says it plays from 2-10 on the box) as the rows took too long to fill up and while it kind of worked, it was very unsatisfying. The simple change to three different lengths of row – especially with the super-short three-card one – means you’re getting to the fun of the game (picking up the cards!) much more quickly. However this does mean people think more, which slows it down – there is real room for ‘analysis paralysis’, as players try to work out their best moves. If you didn’t like the abstract card play behind the original 6 Nimmt, this is unlikely to convert you – unless you just saw it as a luck-fest, in which case you should definitely give X Nimmt a try. The potential flip-side of this is the fact people can now grock things more now – especially as cards go into your hand, meaning people start to remember what still has to come out again. It’s only a small memory element, but it will annoy some; while AP players may well slow things a little, compared to the original. While X Nimmt generally seems to have been received as an improvement on the original, the low player count is raising some eyebrows – especially as it doesn’t seem to be necessary. Most of the game is still simultaneous, so more players shouldn’t add to the game length by much – especially as the game is shorter now anyway. Overall I’m very happy with X Nimmt. The new rules add a small amount of complexity but a lot of strategy and interesting decisions, while bringing a good ‘nimmt’ game to the lower player counts. I think the two should sit side-by-side in any good game collection, and certainly will be doing so in mine – X Nimmt compliments 6 Nimmt, rather than replacing it. * I would like to thank Amigo Spiele for providing a copy of the game for review. This entry was posted in Board games, Essen, Games and tagged board game reviews, card game review by Chris Marling. Bookmark the permalink.